ViSpring (also known as Vispring and Vi-Spring) is a British designer and manufacturer of luxury beds. Founded in 1901, ViSpring was a pioneer in the use of pocket coils in mattresses. The company boasts of ViSpring "handmade pocket-sprung mattresses" being on the HMS Titanic. Their Heritage Mattress was designed as a replica to commemorate the centenniel of that fateful voyage. A screenshot of the mattress's cutaway reveals the coil-on-coil construction. Where did this firm get the name ViSpring? VI is six in Roman numerals. According to the company, 6 is the ideal number of turns [they say "coils"] for a spring. So "VI spring" means, in our terms, a six-turn coil spring. Traditionally made, ViSpring innerspring mattresses have earned a reputation for the use of natural materials. After the steel springs, ingredients include British wool and fleece, silk, cashmere, horestail hair, linen, cotton, and coir (coconut fibers embeded in latex). Vispring claims to not use synthetic materials, including glues and foams. This results in about 50% more upholstery material in a ViSpring mattress than in a modern bed using conventional foams. Vi-Spring boasts of bespoke design (for those of us in the United States, that is made-to-order). Since all of their beds are hand-crafted, automatic machines do not need to be re-configured for custom dimensions and shapes of mattresses. The ViSpring website displays an Island Bed, circular in shape. They also make mattresses for traditional four-poster beds, as well as special dimensions, making this company a perfect provider of mattresses for beds in luxury yachts and personal aircraft. Eight mattresses are featured on the ViSpring website. The Masterpiece, The Signatory, The Sublime Superb, The Shetland Superb, The Classic Superb, The Regal Superb, The Coronet, and The Elite. Speaking about their website, each page has a center picture. On the left margin is a click-on index to that page. On the right are pull-out pages that open up a third of the way across the screen with detail information. Britain and Europe are not the only markets for Vi-Spring luxury mattresses. For some time they have been available in North America. Two years ago, the UK firm established a partnership with E.S. Kluft, the U.S. manufacturer of Kluft and Aireloom luxury beds. This year, the Flex Group, based in Spain, completed acquisition of ViSpring and Kluft/Aireloom, making it the world's largest producer of upper end luxury mattresses. In the Fall of 2015, Vispring launced its revised website. Suitable for a firm with an international market, the opening page asks for the viewer's region and language. The home page for US English has five tabs: About, Bed Collection, My Vispring, In View, and a magnifying glass icon (for Search). The bar with these tabs appears at the top of every page. About tells about the company. There are several pages of material under three headings: Heritage, Craftmanship and Ingredients. The revised Vispring website also has a revised listing of mattresses with nine models. It still has Classic Superb, Coronet, Elite, Regal Superb, Shetland Superb and Sublime Superb. Two models are upgrades: Masterpiece is now Masterpiece Superb and Signatory is now Signatory Superb. Tiara Superb is a new model. Made-to-Measure has two sub-headings: Bespoke Mattresses and Yacht Range (apparently Vispring uses range to mean a series). 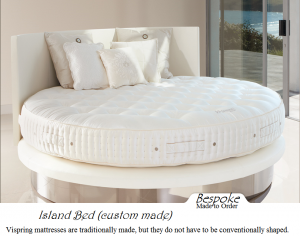 Bespoke Mattresses are those which are custom designed, including special shapes and sizes. Yacht Range tell about the beds Vispring has made for yachts and luxury liners. This is followed by posting of articles featuring Vispring in Superyacht Design (July 2015), Style (June 2015), Solon Interior (May 2015), Harvest (January 2015), and five other publications. Finishing Touches is linked to at the end of each model description. These are choices the buyer of a Vispring mattress has. 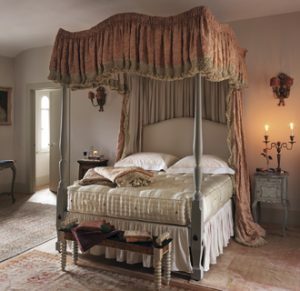 They include headboards, fabrics, legs, toppers, accessories and other options. Find a Bed has three categories of information: How to Choose, Compare, and Size Guide. My Vispring has three headings: Register your guarantee, After-Sales, and Caring for your bed. In View has three headings: Nights to Remember helps a site visitor to find the Vispring bed used in a hotel. In the Press has the magazine articles linked to in Yacht Range. Testimonies are the testimonials of Vispring mattress users. At Your Service is the customer service tab. Under it are Contact us, Newsletter and Store Locator. Clicking on the icon of a magnifying glass at the end of the tabs bar brings up a search box. This is a good revision of the Vispring website. What you need to know is most likely there. Unlike the current editions of many other mattress manufacturers' websites (including several of the largest companies), Vispring does have listing of specific models complete with descriptions. These models are easily found on dealers' sites with more detail on some of them, again a contrast with some other firms where it is difficult to find and compare models. The site does lead you from page to page, often presenting a choice of pages for continuance. With the tabs bar alway at the top, it is easy to change directions. If I were rating websites, I'd give Vispring a high mark. Here are the current reviews for beds from "ViSpring"